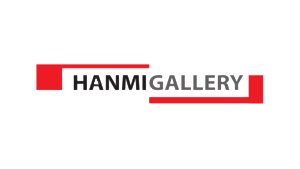 Hanmi Gallery is pleased to announce the exhibition, entitled Readymaker, by Interactive Media artist Ha Seok-Jun working with 3D printing sculpture and interactive video installation. This exhibition is organized in collaboration with Space_BA421 & 10AAA. This exhibition began with economist Jeremy Rifkin’s The Zero Marginal Cost Society’s notion: This society has been running to Zero for making objects add more. Rifkin focuses on the foresight that the capitalism will be faded out soon and we will receive new paradigm. As a result, we will meet a cooperative society of common ownership due to the development of technology network swiftly. Ha suggests that the attempt to look into the relationship between artwork, and economical product through his Readymaker Series No.2. 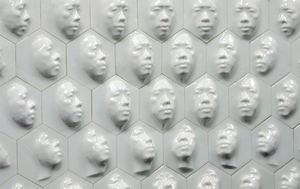 This artwork has many faces (artist’s portrait), made of 3D printing and covered with PLA Plastic, becomes faint gradually from center to edge. In this point, Ha is asking the question that artwork and artist make an object by hand, and can’t avoid this situation like as the economic value is getting lower and lower. As an One-Person Business - Entrepreneur, how should artists prepare for the sharing economy society in the future? Do not need to prepare? Ha treats an artist as the main agents of economic activity at the same time he has many questions and concern. 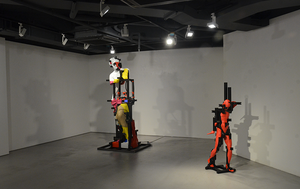 The recent artwork, Readymaker No.2 (2016); a human body colored in red by 3D printing, is connected to previous artwork Platform of Suffering and The Monk. 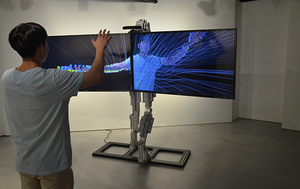 He presents new media art sculpture, Readymaker No.3 (2016), affected by a future novel named A Brave New World (Aldous Huxley, 1932) for this exhibition. The novel described the civilized society and not a civilized society. Ha asked what is our dreaming society in the future. This is shaped from Venus statues 2meter-long and using various colors by 3D printer. And put into the 3D printer in the middle of the valley, it can produce sculpture itself as a main body of production. Artist said that it is uncertain to predict our future but the world changes faster than we expected. Ha would like to present this exhibition to remind the thought of human life and development of technology through the images of working as a media artist in this high technology era.